Each of the MCQ’s carries 1 mark and there is negative marking for wrong answer. Candidates need to have cleared HSSC Pre-Medical with at least 60% marks or anyone having equivalent qualification to ‘Fsc Pre Medical’ is eligible to apply for test. There is no age minimum and maximum limit. 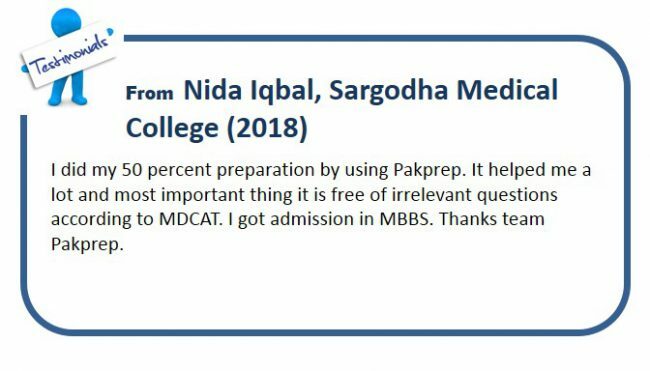 I gave 4 test and became your fan …I have decided to prepare my mdcat preparation from pakprep now I am in fsc part 1 I want to take admission in king Edward medical college. ..
We appreciate your interest in using Pakprep.com. Thank you very much for your feed back and we are more than happy to help you out in getting admission in your dream college. Thanks for this great platform, your website really very helpful for preparing all kinds of test.